First you must answer the question of why you fish. If you fish like I, approaching each pool and run, studying the currents, determining the best cast and lie, presently the fly to where your logic and experience suggests a trout may lurk, bamboo is for you. If you have the time to glance around seeing the marsh marigolds, the hills and wildlife, feeling the breeze, taking the time to just sit on the bank and access your part in the grand scheme of things, bamboo is for you. But if you transpose your everyday world into how you fish, casting quickly and rushing off to the next place, measuring each day by how many miles of trout stream you’ve covered, miles driven or other fishermen seen, perhaps bamboo is not for you. 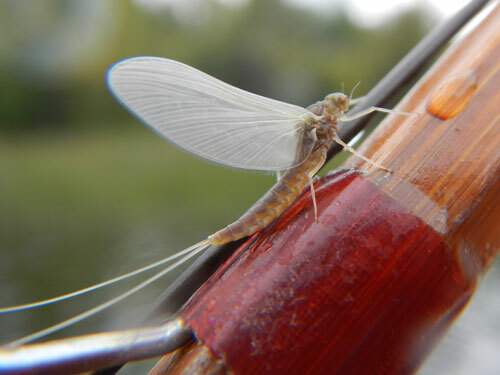 Bamboo fly rods are about cadence - the cadence of life itself. Each cast is slower and deliberate, forcing you to slow down and become one with the setting around you. But if your temperament is running and gunning, bamboo isn’t for you. Some years ago, I was asked to build a bamboo fly rod for a young fellow who just hungered after the next/greatest rod. While I could have built the rod, I told him that he was about 20 years too soon. He had to learn to slow down, become part of the world around him when he fished and then and only then would he appreciate what the bamboo rod was all about. So if today, you think that it’s time that your fishing becomes less of a aerobic exercise and more of a contemplative union with nature, bamboo is for you. After all, it is a natural material, one with nature. The rodmaking video is done! Web page designed by Michael Dell for a left-handed perspective. The site is now modified/bent and stapled by Don Andersen who has little>no knowledge about HTML and would much rather be building rods.. Contents are copyright 1999-2019 by Don Andersen. Original watercolour Royal Coachman courtesy of Clive Schaupmeyer. Must See video on how tough bamboo rods are!